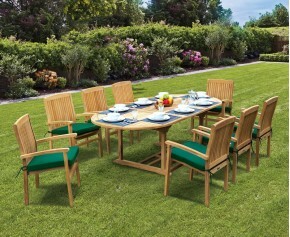 Ideal for large outdoor spaces, our Santorini dining sets provide plentiful seating and room for al fresco dining. Featuring stacking chairs, our Santorini dining sets are practical and require minimal maintenance. Our Santorini dining sets feature either fixed teak dining tables or extending teak dining tables, so you can choose which style fits your purpose best. Made from the finest grade-A teak, our Santorini dining sets are hard wearing and extremely durable, ensuring fruitful use for years to come. Able to remain outdoors in even the most inclement of weather conditions, our teak dining tables are sure to last a lifetime. 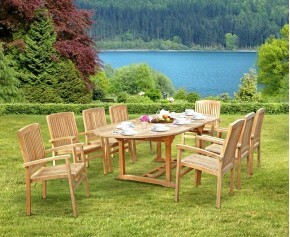 Our Santorini dining sets will look lovely as a charming focal point in your outdoor space. Browse our range of Santorini dining sets here.